Some years ago I discovered this recipe was suitable to end a meal as important as Christmas. It is very simple to implement and can be prepared well in advance. Pomegranates are very useful for your stomach and its tannins help fight inflammation. The shape of the pomegrante is often used as a symbol of cooperation (the seeds cluster in groups and live together in a single fruit). It should not be missing from the tables for Christmas. The red color gives a hint of fragrant joy. In order to squeeze the juice from pomegranates, it is necessary to have a juicer that has a ring to hold the seeds. Otherwise you will end up with parts of the seeds in your juice. Pomegrantes are juiced by hand rolling the fruit first to crush some seeds inside and facilitate pressing. It should then be cut in half horizontally and squeezed like a lemon on top the juicer. Prepare the water and sugar syrup by boiling the two together for a few minutes until the sugar is dissolved. Allow to cool. 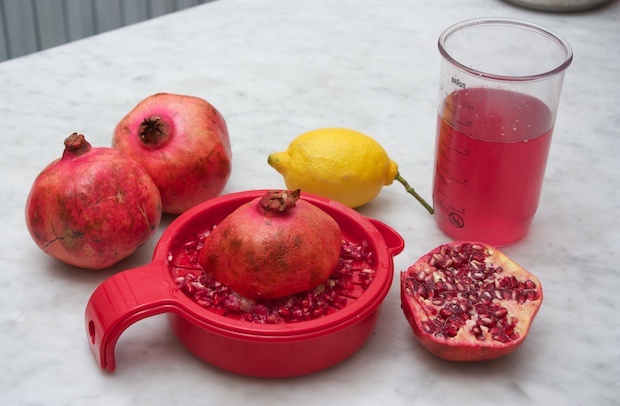 Squeeze the lemon juice and pomegranates. Allow the syrup cool. Pour into a steel container and put in the freezer cover with foil. After 30 minutes remove from the freezer and whip the compound in order to break the ice crystals. Repeat after an hour and again after another hour. Then let the mixture completely freeze until it is ready to serve. 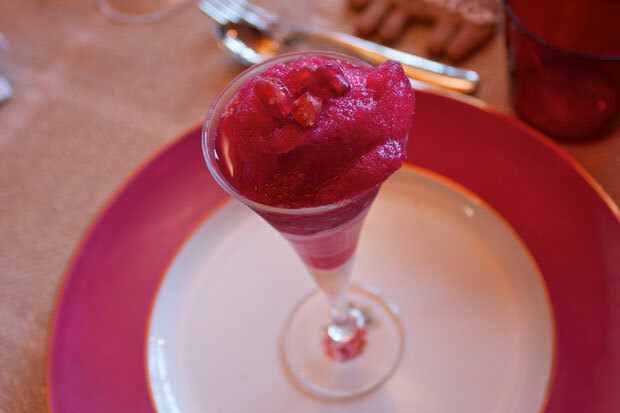 Using an icecream scoop, scrape a small amount of the sorbet and serve in little glasses.